Our latest installment of the Third Sunday Lord’s Table was held on March 18th during our worship service. The theme of this month’s celebration was, ‘…no easy task, the broken woman’ and sought to deal with the scourge of domestic violence. We celebrate our Lord’s Table every third Sunday with an eye towards sharing that the Sacrament of our Lord’s Supper is at its heart a call to action, a call to engage in some of the most pressing social issues and sources of injustice in our culture and society. In an era of increasing awareness and activism surrounding the holy call to raise up the voices of voiceless women throughout our society, this theme was chosen to highlight those concerns and to encourage those participating to reflect and take a strong position regarding what our Lord is calling for in this radical call to truly open ourselves to the truth that all people, both men and women have gifts and talents to give and to share, and that there is no way a new day of goodness and grace can dawn if women are not allowed to be full partners in the search and journey. And in particular the service sought to illustrate that there remains a critical need to root out violence towards women that can be so prevalent ‘behind closed doors’. The morning’s altar was truly one of our Lord’s tables. It was intended to be a simple yet powerful symbol reminding us of how intensely personal domestic violence truly is. A symbol of the ways in which, and the energy with which women are kept from being all that our Lord has gifted and called them to be, namely full partners with men in the complete and total ordering of our lives and dreams along with the future goodness we all strive for. Lord may it be increasingly so that our ministry of love and compassion in your name reaches more and more of your people in need as our awareness of and engagement with all that would continue to divide and separate us as your family begins to break cycles of violence and injury within our homes and the homes of our neighbors. Help us to open hearts locked in fear towards your healing grace and let us never stand idly by as a sister or a brother’s soul is needlessly ravaged. Help us to be a light that shines in the darkness so that truly all may begin to feel free to come from the east and the west, and from the north and the south. 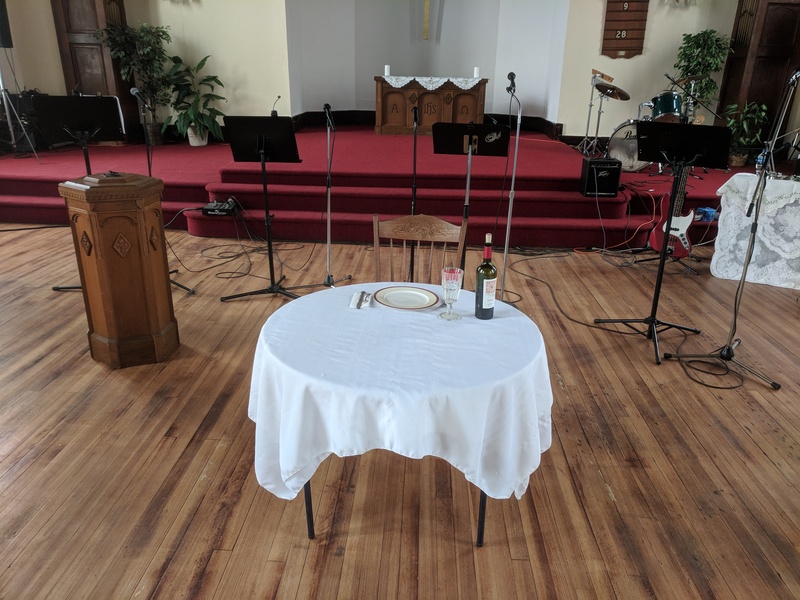 The ‘single place set’ table’ here before us this morning is holy because our Lord has made it so through our recognition of and challenge to it…and because our Lord is always present in the breaking of the bread and the sharing of the one cup. Let us reverence this meal shared together in love, may it bless our bodies just as it moves us to greater compassion and clarity of discernment in all instances of wrongful abuse directed towards our sisters and our brothers. May we find the way to invite both the one who has been broken and the one who breaks into the healing circle of your forgiving love and grace. Give us the sensitivity and the wisdom to serve as you would, to graciously care for just as you would, and to love with your love. A Litany of Compassion Who am I…??? Lonely, so lonely…beaten and sore, can’t wait for night’s silence, a moment…to breathe. Yet measured just so, so afraid he might wake, and begin once again…bruise the bruise, pain the pain. Oh, blessed daybreak brings solace, yet sunlight brings shame. Most injuries heal, but the wound still remains. I am unnamed…unknown…and unheard. (All) Who am I …am I a woman? Near the end of each day it begins once again, must quick find a corner, a closet to hide. Each curse, moan, and slap hurts as though it were mine; we share the same tears, the same confusion of fear. How long…oh how long will this hellish-life endure? Silent and broken…told never to share. (All) Who am I …am I a child? I don’t know what’s wrong, why such uproar and fuss, we each have our role, we each have our place. Spare the rod, spoil the wife…I’m the head of my house, ordained that it be so Holy Scriptures do tell. I toil all the day to get what is mine, nothing new, nothing different, than many I know. A little correction, and everything’s fine, she’s mine, don’t you mess with my life! (All) Who am I …am I a husband? (All) Who am I …was I a friend? She tells me such stories…but I just don’t know, I tell her be stronger, it surely will pass. You see, times they are hard and there’s always two sides, at least this man loves her and comes home every night. Now be a good wife and take care of him well, there must be a reason, there must be something you’ve done. Go fix his dinner and turn down the bed, Please, please listen and mind what I’ve said. (All) Who am I …am I a mother? Sometimes I wonder why so many complain, I’ve known them since childhood, it surely can’t be. I’ve always said never on my watch will this be, I run a tight ship; I know each one, by name. Now you know God’s plan is ordered, His will must be done, they’ll be fine, don’t you worry, it’s nothing I’m sure. I know, for it is not in my Church! (All) Who am I …am I a pastor? Every tear that you have shed, every blow you have suffered, breaks my heart with your sorrow, makes me cry out in pain. I know you are lonely and think I am gone, but I’m here by your side and will never let go. I will hold you and cherish in light and darkness, in the depths of your dying I too will be there. Aside from your child, listen not to the lost, their blindness, self-comfort, they are numb beyond life. Yes my love I will hold you, though battered and torn, I am here with you, and I call you by name.